10.25.09 = This old clock radio reminded me of a similar one we had on top of the refrigerator when I was growing up. I can almost hear it now, “…Switzerland County schools, closed…Talawanda City schools, closed…” No mention of Sycamore schools, but it’s still snowing. Nothing gets a kid out of bed faster in morning than mentioning that four letter word, “SNOW”. I remember sitting in the kitchen eating breakfast, listening and waiting for the school closings on 700 WLW. “…Loveland, closed, Madeira, closed, Mariemont, closed….” Surely if Mariemont was closed we would be as well, however we had to wait through all the “Saints” before any mention of Sycamore. “…Sycamore, closed…” YES! Those were the days! This concludes my “nostalgia” series. Thanks to all my fellow Smuggers; it’s been fun reading all your comments about coffee, lunch boxes and poor Raggedy Ann this week. Smuggers really are the best! What a blast from the past! Glad it brought back some memories for you -- loved this series! It's the tablecloth that I'm remembering! Does that date me? why is it that no one can take me on a walk down memory lane like you can? That picture and your recollections certainly take me back. Nice job K.
Great nostalgic radio and love the story!! this is wonderful and what great memories! fantastic shot. I love how you picked the perfect color coffee table for the shot. Delightful commentary. "Union County schools CLOSED:-)" I'm afraid that was on the TV, though. 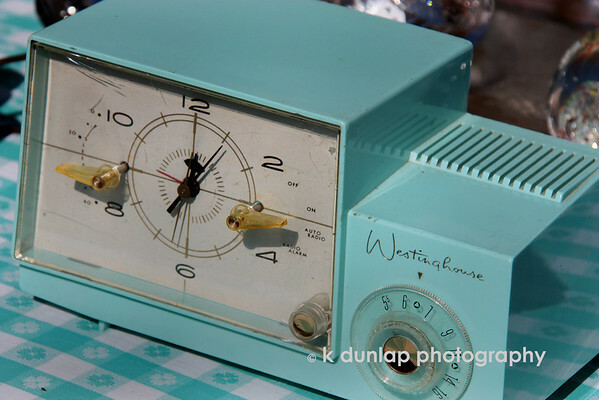 However, this reminds me of the old radio my parents had in the kitchen growing up in NJ.